We awoke to a sunny, warm day in St Augustine and were ready to explore our new turf! We now had a lovely view of the waterfront that we had not been able to see when we arrived in the dark. We had a special dinner planned for our evening, so we thought we’d spend the afternoon visiting with Matt and Jessica at the boatyard. The boatyard is nearby, about 1.3 miles from the Municipal Marina where Rode Trip is moored. This was a great opportunity for a run. Brian referenced the google map and in order to see some of downtown and maximize our exercise potential he added 1 mile to our route. 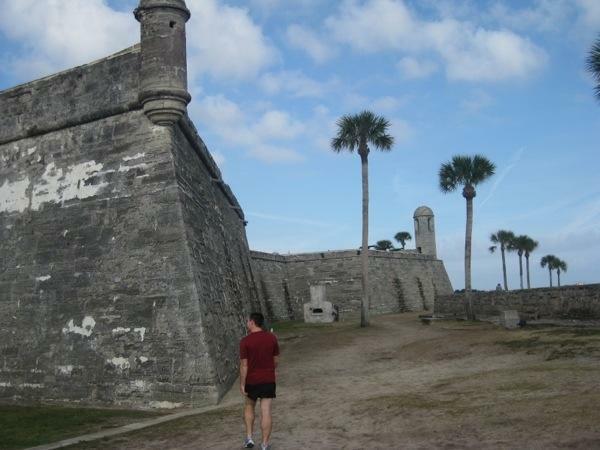 Along the way we ran around the Castillo de san Marcos; quite literally around as we looped the fort inside of the moat. 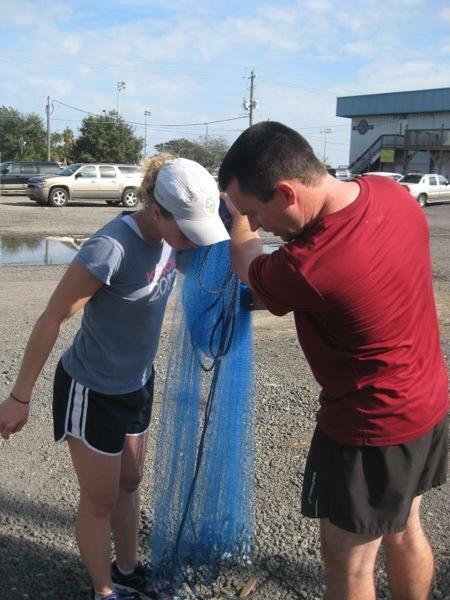 At the boatyard, Matt and Jessica were gearing up for a big day. 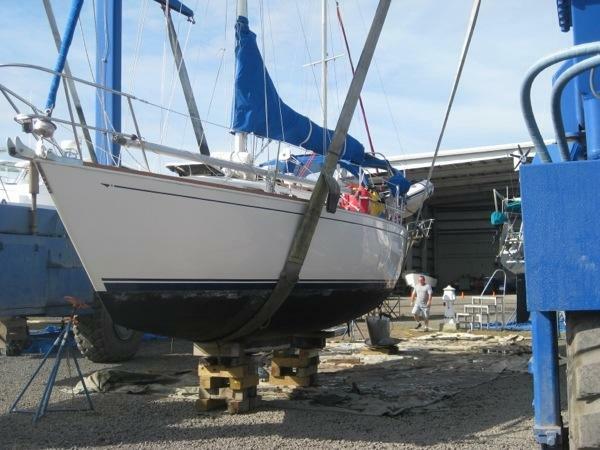 Serendipity was scheduled to have her keel dropped (separating the keel a.k.a. lead weight from the hull of the boat) for inspection. This was progress along the road to repair! We had some time to kill prior to Serendipity being loaded into the sling. 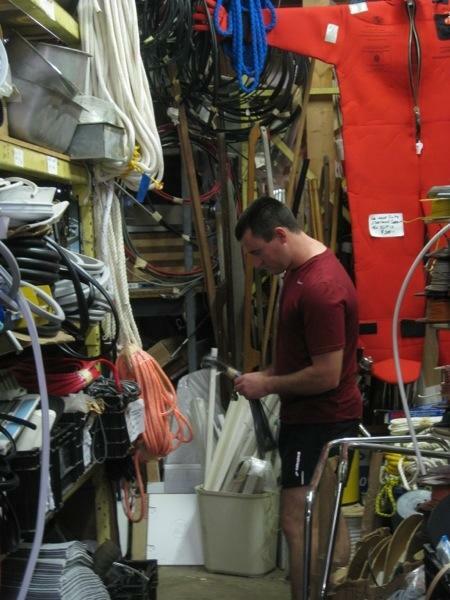 Matt suggested we check out the Sailors’ Exchange, a boating resale shop. Jessica and I made ourselves comfortable in the book section while the guys sorted through junk. The treasure found today at Sailors’ Exchange was a cast net to add to Matt’s collection of fishing gear. 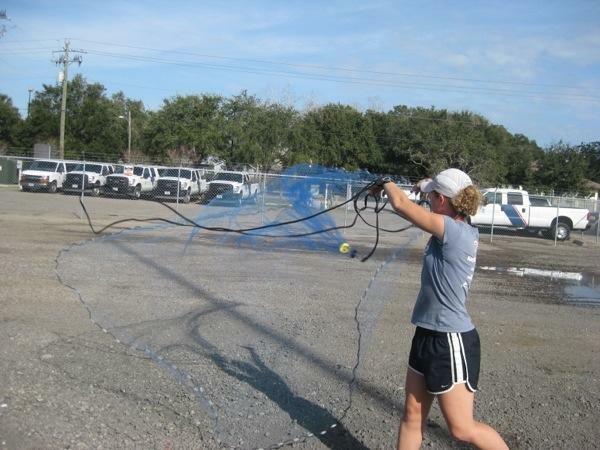 Back at the boatyard, Brian gave cast net throwing lessons. We’re looking forward to the next dinner party on Serendipity…now serving the catch of the day! The afternoon flew by and it was already time to head home to get cleaned up for dinner. Brian and I walked back toward town weaving through side streets admiring colorful houses. We found a pond and spotted several colorful fish, noting that we should further investigate this location. At the marina’s dinghy dock, warm welcomes were exchanged when Bob and Susan arrived. Our first visitors to Rode Trip in 2013! Bob and Susan came aboard for the grand tour. Afterward, we sampled some delicious beer at the ale house across the street. Yes it’s so close we can practically park the dinghy on the front stoop…dangerously tempting for beer lovers! We topped off a perfect day with a fabulous meal at one of Bob and Susan’s favorite restaurants. Bob and Susan will be showing us a few other St Augustine sights during our stay. We are looking forward to enjoying their company! 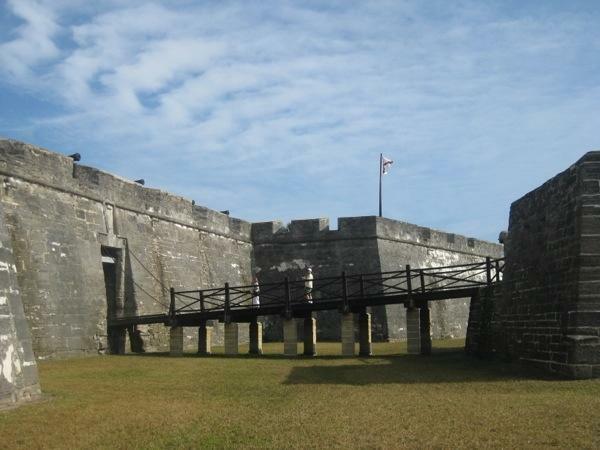 This entry was posted in Uncategorized and tagged Castillo de san Marcos, Sailors' Exchange by stephanie. Bookmark the permalink. The A1ABrewery is just the place to be!! 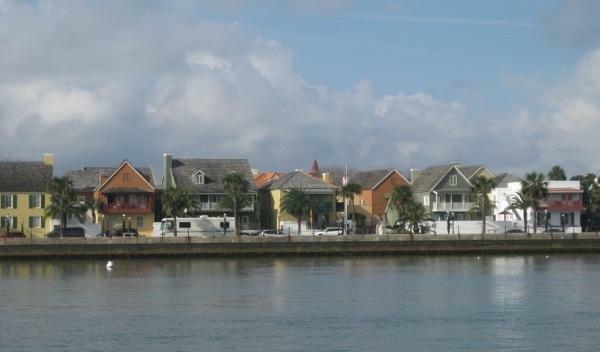 Glad you got to St. Augustine safely and enjoyed your time ashore. We love St Augustine and will be stopping on our way down. 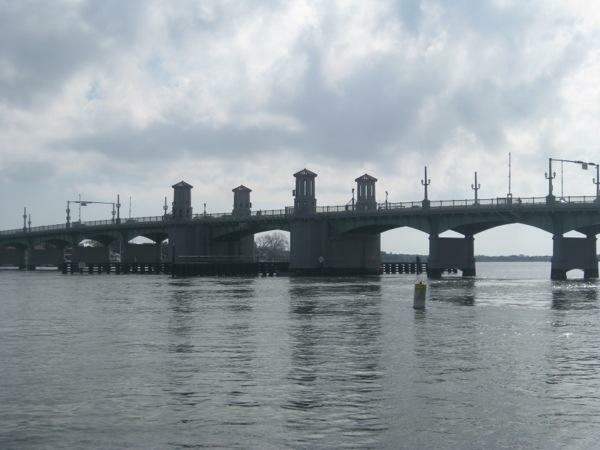 We did an overnight last night from Beaufort, NC in some very rolly seas to Masonsboro Inlet and made it down to Southport for couple of days. We hit the currents RIGHT for a change and were doing 10 knots coming down the Cape Fear from Snows Cut to Southport!! Woo-hoo!! !